After a childhood of poverty and petty crime in the slums of London, William Thornhill is sentenced in 1806 to be transported to New South Wales for the term of his natural life. With his wife Sal and children in tow, he arrives in a harsh land that feels at first like a death sentence. But among the convicts there is a whisper that freedom can be bought, an opportunity to start afresh.Away from the infant township of Sydney, up the Hawkesbury River, Thornhill encounters men who have tried to do just that: Blackwood, who is attempting to reconcile himself with the place and its people, and Smasher Williams, whose fear of this alien world turns into brutal depravity towards it. 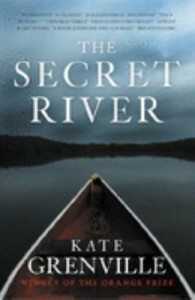 As Thornhill and his family stake their claim on a patch of ground by the river, the battle lines between old and new inhabitants are drawn.The Secret River joins a tradition of grand historical fiction that stretches from Thomas Keneally’s The Chant of Jimmy Blacksmith and Peter Carey’s True History of the Kelly Gang. It was interesting to read about the conflicted feelings that the settlers had towards the Aboriginal people. The historical background and character development was complex and very interesting. The author is non-judgemental and allows the reader to draw their own conclusions about the various character’s morality. Kate Grenville is a gret writer and the description of London life and colonial life is very well portrayed. The attitude of the colonists was very sad and the bitterness which is still near was very confronting. The character of William’s wife Sal was warm and optimistic and she was willing to work with the Aboriginal people. Overall the book is very poignant and shows both perspectives of black and white.